After three years of reconstruction work, the Museum of Fine Arts is now again open for visitors in Budapest. The museumʼs heating and air conditioning system was upgraded, much of the roof replaced, and new exhibition and public spaces created during the renovations, along with new underground storage facilities. 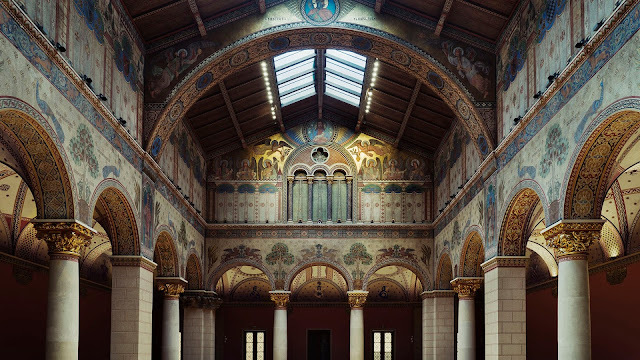 The most visible part of the reconstruction of the building is the newly reopened grand Romanesque Hall, which had been closed to the public since 1945. Unfortunately, the great collection of plaster casts is no longer there; the Hall will be used mainly for events. A publication, as well as a special website was dedicated to the history and restoration of the Romanesque Hall. The Museum of Fine Arts reopened to the public on October 31, 2018. At this time, about half of the permanent exhibitions are ready: the exhibition of Ancient Egypt, the exhibition of Classical Antiquity, the Old Sculpture Collection (European sculpture from 1350-1800) and part of the Old Master's Gallery (European Art 1250-1600). A new addition to the exhibitions at the Museum of Fine Arts is the Hungarian Baroque exhibition (Art in Hungary 1600-1800) - this is part of the controversial project of merging of the Museum of Fine Arts and the Hungarian National Gallery. In the future, the Museum of Fine Arts will only display Ancient and pre-1800 art, while a new museum will be built for western art after 1800 (see the website of the Liget Budapest project). Hungarian medieval art from the National Gallery will also be moved to the Museum of Fine Arts, where further parts of the permanent exhibitions are scheduled to open in 2019. A temporary exhibition was also put on display, dedicated to the small bronze statue of a horse and rider, attributed to Leonardo da Vinci. The exhibition is inside a wonderful space for smaller exhibitions, the Michelangelo Hall, which was also fully restored. Along with the reconstruction of the museum building, the logo and the website of the Museum were also upgraded. For more information on the permanent exhibitions as well as on the collections of the Museum of Fine Arts, head on over there. 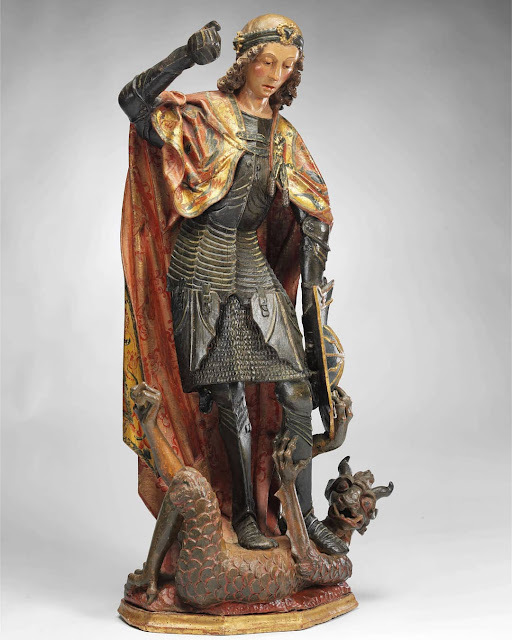 As an illustration for this post, I am including a photo of a new acquisition by the Museum, a late-fifteenth century Spanish statue of St. Michael, carved by Gil de Siloé. The statue is now on display in the galleries of European art. 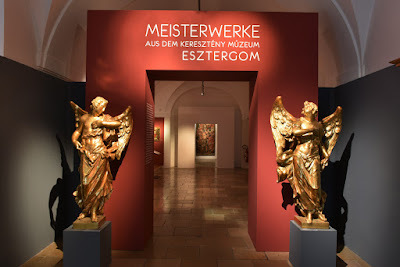 The Christian Museum of Esztergom is the largest ecclesiastical collection in Hungary and is one of the oldest public collections in the nation. It was established in 1875 by Archbishop and Prince Primate János Simor (1813-1891) and was based on his private collection. The intention of the Archbishop was to make known to the general public old and new treasures of art, and thereby cultivate the aesthetic taste of the visitors. Archbishop Simor purchased works of art primarily from legacies and during his travels abroad. He also had parts of medieval altarpieces collected from the territory of the Archdiocese of Esztergom. Following Primate Simor’s death in 1891, the Museum’s collections grew significantly when the bequest of Arnold Ipolyi, Bishop of Nagyvárad/Oradea (1823-1886), which consisted mainly of late medieval Italian, German, Austrian and Hungarian paintings and sculptures, finally arrived to Esztergom in 1920. The resulting museum is the third most significant historic picture gallery in Hungary, on account of its Hungarian, Italian, Netherlandish, German and Austrian paintings. 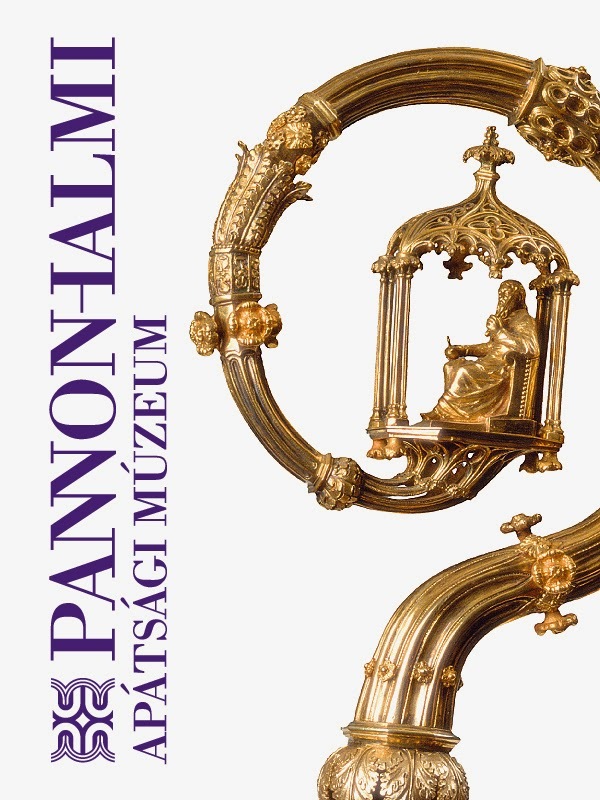 As one of the results of a research project financed by the Hungarian Scientific Research Fund (OTKA PD 104215), an exhaustive online summary catalogue of the Hungarian, German and Austrian Late Medieval Collection of the Christian Museum was published online. 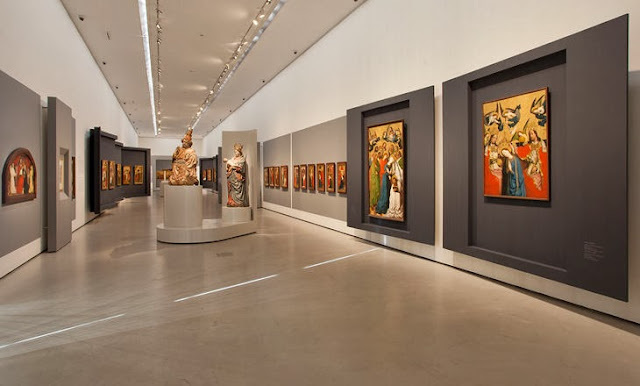 This is one of the most famous parts of the collections, containing among others the altarpiece from Garamszentbenedek, painted by Thomas de Coloswar in 1427, or four panels depicting scenes from the Passion and painted by the enigmatic Master MS in 1506. Already in the middle of the 19th century, both János Simor and Arnold Ipolyi recognized the significance of these medieval works of art, most of which were not in use any more. Simor brought to the museum painted fragments of winged altarpieces that had been dismantled, primarily from the Benedictine Abbey of Garamszentbenedek (Hronsky Benadik). Sculptures in the museum mainly come from the Ipolyi collection, along with the majority of medieval Austrian and German works of art. Perhaps the most important event of the 500th anniversary of the Reformation is the major exhibition organized by the Hungarian National Museum, titled Grammar and Grace - 500 Years of Reformation. 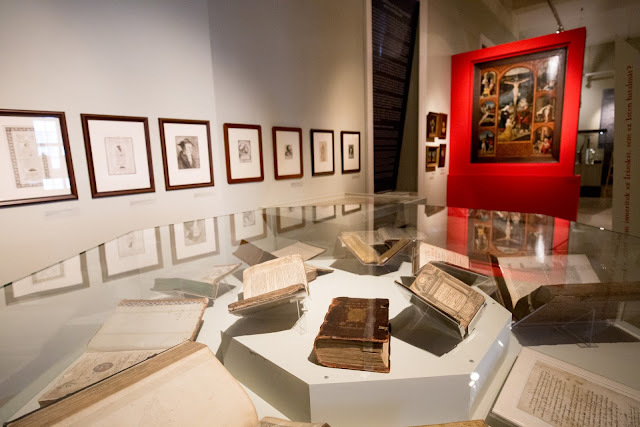 The exhibition, which will be on view until November 5, 2017, offers a look at the ever-changing, complex relations of the Hungarian Reformation, and includes a series of unequaled treasures. The exhibition was brought to the audience by the exemplary collaboration of museums, collections and parishes in and out of Hungary, and its co-curators represent the most important ecclesiastical collections in the country. While the topic of the exhibition is post-medieval, the exhibition itself provides a wide range of medieval objects as well. This is partly because the narrative focuses more on continuity and connections rather than on radical breaks and destruction. Thus topics of the exhibition include the survival and reuse of medieval liturgical objects in a Protestant context, as well as the transformation of some pre-reformation artworks for later use. 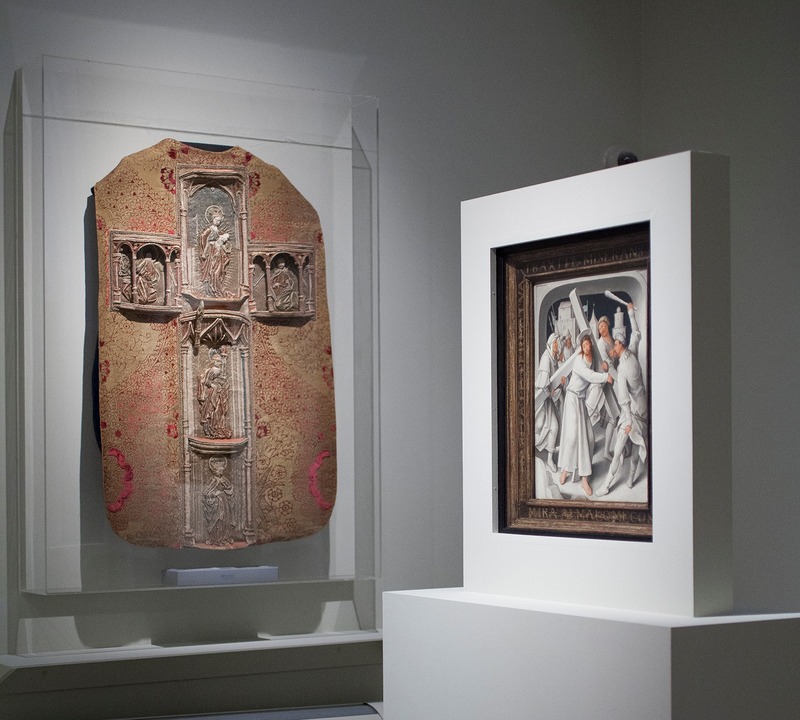 The introductory part of the exhibition specifically focuses on medieval art: it provides an overview of European religious beliefs and practices of the late 15th century, so the eve of the Reformation (see image on the right). As explained in the overview of the exhibition, "Europe in the 15th century was bursting with anticipation, fear and hope. The plague epidemics – the evil feasting in the world – decimating the secular society and the church alike, the evil feasting in the world made the majority of the Christian community find new ideas to follow. Searching for salvation created forms of piety never seen before and launched new social-spiritual movements. Prophets popped up everywhere preaching about the end of the world closing in, encouraging conversion and purification of the church and declining the practice of paying money instead of acting in the right Christian way." This is illustrated in the exhibition with a series of late medieval altarpieces, statues, devotional books and prints and other objects. Following the introduction, the exhibition surveys the appearance and rapid spread of the Reformation in Central Europe, specifically in Hungary. The theses of Luther made it to Hungary and to the royal court in Buda itself as early as the 1520s by merchants, German noblemen and Humanists. The Kingdom of Hungary fell at the Battle of Mohács in 1526, and starting from the 1530s Protestant preachers had been wandering about in the country, and new churches and religious communities came into life. By the second half of the 16th century the country was lost in the political sense due to the Turkish occupation and being torn into three parts. The permanent and threatening presence of the Turkish power, the cooperation they forced with Hungarians in the occupied regions and the power vacuum all led to an unprecedented level of freedom of speech and religion resulting in the Carpathian Basin turning into the most diverse parts of Europe in terms of denominations. The exhibition surveys these historical developments, focusing on different Protestant churches, and also chronicling religious debates and conflicts. Later parts of the exhibition tell about the role of Protestant churches in various communities: in cities, smaller towns and villages, and also focus on the role of these churches in the cultural life of Hungary. Loans from all over the Carpathian basin, as well as from western Europe result in one of the largest historical art exhibitions of recent year, the organization of which was no small feat for the National Museum and for its chief curator, Erika Kiss. Just as units of the exhibition focus on community and cooperation, the exhibition itself is the result of the cooperation of curators and collections. A lot of objects come from the National Museum itself, and the Széchenyi National Library was also one of the major lenders, but there are objects from about 100 lenders in the exhibition. This includes ecclesiastical collections (the National Lutheran Museum in Budapest, the Ráday Collection of the Calvinist Church), the Hungarian Academy of Sciences, the Museum of Fine Arts and the National Gallery, the Museum of Applied Arts and many others. 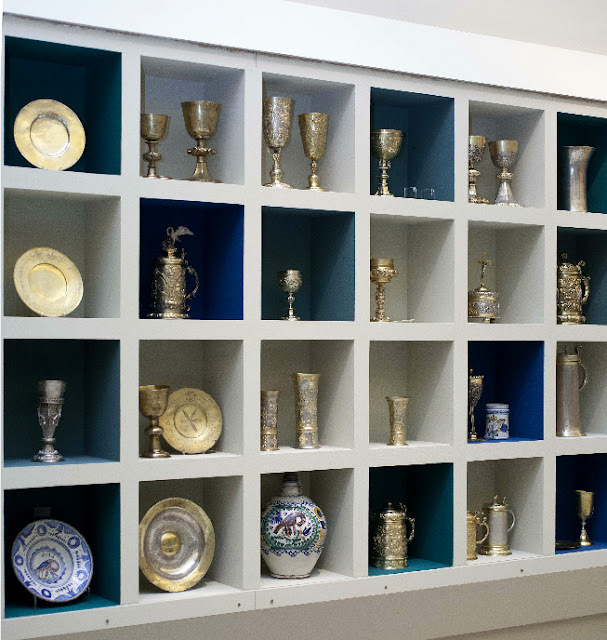 In addition, several small ecclesiastical collections and church communities have lent their treasures, many of which have not been exhibited in decades. It is a carefully organized, beautifully installed and very interesting exhibition. It was designed by Tibor Somlai, who has already proved his talent with several other major exhibition designs. Two new collection catalogues of the Museum of Fine Arts (Szépművészeti Múzeum) in Budapest have been published recently. The catalogues treat some of the most important medieval and early Renaissance paintings in Hungary: one volume is dedicated to Early Netherlandish paintings, while the other deals with Sienese paintings. 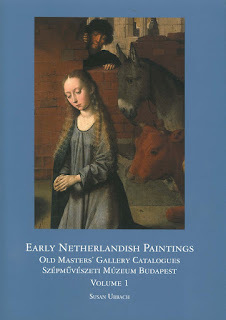 The long-awaited volume by Susan Urbach, titled Early Netherlandish Paintings in Budapest, was published by Harvey Miller/Brepols. The volume includes extensive catalogue entries on 49 works dating from c. 1460 to c. 1540, in the collection of the Museum of Fine Arts, Budapest. This is the first volume of a series on Flemish paintings in Budapest, and covers about a third of the entire collection from the 15th century through to the 17th. The volume includes the results of a detailed technical analysis carried out on the panels. Below is one of the key works featured in the book (and on the cover): the Adoration of the Shepherds by Gerard David. 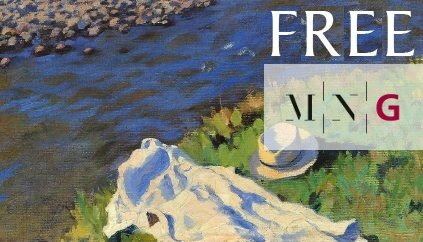 You can find additional paintings in the collection database of the Museum of Fine Arts. 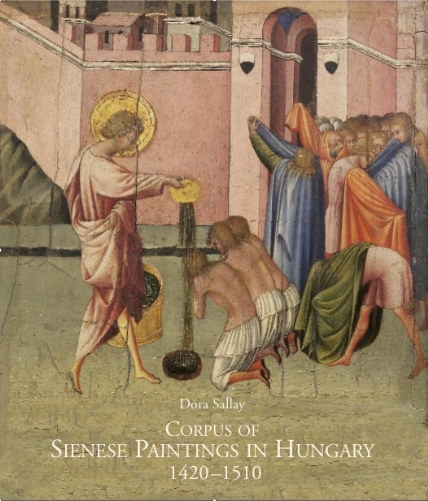 The other book is the Corpus of Sienese Paintings in Hungary 1420-1510, written by Dóra Sallay. This also is part of series planned for three volumes: future volumes will cover the periods 1250-1420 and 1510-1650. The catalogue, published by Centro Di of Florence, includes painting not only from the Museum of Fine Arts, but also from the Christian Museum in Esztergom, Hungary's second most important collection of early paintings. The richly illustrated catalogue presents extensive and updated biographies of the artists, and the entries provide significant new findings on questions of attribution, dating and iconography, original context and function, the circumstances of the commission, the reconstruction of now dismembered structures, and various other issues dealing with the relationship between the paintings and the art and culture of their time. The catalogue of paintings is preceded by an essay on the history of their collecting, conservation and previous research. On the cover of the book, you can see Giovanni di Paolo's St. Ansanus Baptizes the People of Siena, from the Christian Museum in Esztergom. 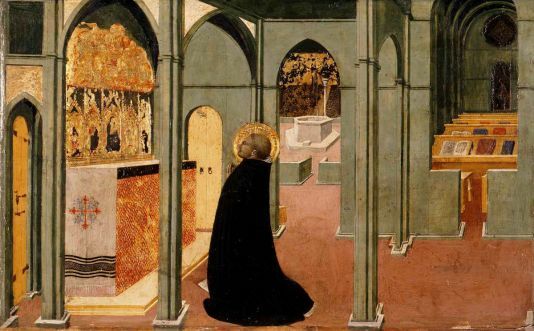 For another illustration, I selected a work from the Museum of Fine Arts: Sassetta's St. Thomas Aquinas in Prayer, which was a predella picture of his Arte della Lana altarpiece, made for the Sienese guild and dedicated to the Eucharist (1423-25). The Christian Museum of Esztergom is the largest ecclesiastical collection in Hungary, conserving European and Hungarian works of art from several centuries. Opened for the public in 1875, it became the third most significant picture gallery in Hungary, closely following the Museum of Fine Arts and the Hungarian National Gallery in Budapest, mainly on account of its Hungarian, Italian, Netherlandish, German and Austrian paintings. Besides the late medieval works of art also the baroque and modern collections, the exceptionally rich collection of the decorative arts, and the collection of prints and drawings are significant. The museum was invited by the Diözesanmuseum St. Pölten in Austria to exhibit around 100 pieces of its collections. The aim of the exhibition and its accompanying catalogue was to offer a view for the German-speaking visitors on the quite unknown and thus for many people surprisingly rich and manifold collection of the Christian Museum and at the same time make the history of Esztergom and of its collections more well-known. Emese Sarkadi Nagy, researcher at the Christian Museum has provided an overview of the exhibition for readers of the Medieval Hungary blog. Her text follows below. The material was selected in a way to mirror the diversity of the complete collection, thus objects from the Middle Ages to the twentieth century from several territories are present; however, the most valuable pieces were not allowed to travel for reasons of conservation. A small selection of the exhibits represents the Old Hungarian Collection of the Christian Museum. A considerable part of this collection is formed by panel painting and wood-sculpture originating from the (in medieval times) mainly German-speaking mining towns of so-called Lower Hungary (part of present day's western Slovakia). Workshops of these mining towns produced pieces of liturgical furnishing for a number of parish- and abbey churches of the region, among which are also pieces for the Benedictine Abbey of Garamszentbenedek (Hronský Beňadik, Sankt Benedikt). Besides the famous Calvary-altarpiece of Thomas de Coloswar, dated to 1427 and the wooden Lord's coffin dated to the 1480s (neither of which could be transported to the Austrian exhibition), a number of 15th and 16th century altarpieces and fragments of altarpieces were collected/saved by the founder of the Museum, cardinal János Simor at the end of the 19th century and brought to Esztergom. Two panels of a Calvary altarpiece from 1495 stand for the furnishing of the Garamszentbenedek Abbey in the exhibition. A panel depicting three female Saints, belonging once to an altarpiece originating from Sáros County (Comitatus Sarosiensis), mirroring probably Polish influences, stands for the painting of this more eastern region. Last December marked the 70th anniversary of the death of art historian András Péter. He was a noted scholar of Italian Trecento painting, as well as of Hungarian medieval art. Born in 1903, he studied in Budapest and defended his doctorate in 1925. The subject of his dissertation was the representation of Hungarian holy kings in medieval art. Later he published a series of important articles on key figures of Italian Trecento painting, especially on Sienese masters such as the Lorenzetti brothers and Simone Martini. Material for these studies was collected during his research trips to Italy, most notably through a grant at the Hungarian Historical Institute in Rome (1926-27). In 1930, he published a ground-breaking survey of the history of Hungarian art. In 1935, he became a tutor at the art history department of Tibor Gerevich at Budapest University (named after Péter Pázmány at the time, and now known as Eötvös Loránd University). His monograph on Italian Trecento painting, however, remained unfinished, and was published posthumously in 1983. Now a new volume has appeared, which contains the collected studies of András Péter. Edited by Mária Prokopp and Károly Tóth, the book republishes his writings in chronological order, starting with his dissertation, which was previously only available in manuscript form. Several of these studies were published in international journals, and are considered important contributions to this day. Pietro és Ambrogio Lorenzetti egy elpusztult freskó-ciklusa = Ein verlorener Freskenzyklus der Brüder Lorenzetti. In: Az Országos Magyar Szépművészeti Múzeum Évkönyvei = Jahrbücher des Museums der Bildenden Künste in Budapest VI. 1929-1930. (1931). 52-81. 256-260. Quand Simone Martini est-il venu en Avignon? In: Gazette des Beaux-Arts, 81 (1939), 153-174. His full bibliography can also be consulted online, as compiled by the Library of the Museum of Fine Arts. András Péter's career was cut short by the Holocaust. He stayed in Budapest even during the German occupation of Hungary and during the rule of the Arrow Cross. He was arrested by the Arrow Cross, and killed on December 9th, 1944. Sadly, he was not the only important art historian who fell victim to the Holocaust in Hungary. 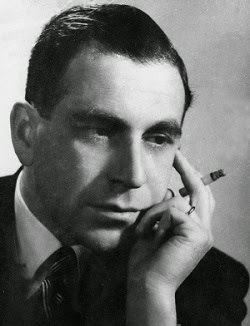 We should mention first of all his friend, György Gombosi, another noted scholar of Italian early renaissance art, who died in Auschwitz in early 1945. Others include József Bíró, an eminent historian of art in Transylvania, who was shot into the Danube together with his elderly father at the beginning of 1945 (see here his monograph on palaces in Transylvania); and art critic Artúr Elek, who committed suicide after Germany occupied Hungary in 1944. A friend of Ernst Gombrich, József Bodonyi, who had studied with Julius von Schlosser in Vienna and wrote his dissertation on the origin of gold background in Late Antique painting, also died in 1944 after returning to Hungary. A generation of (mostly Jewish) Hungarian art historians had already emigrated from Hungary after 1919 including Johannes Wilde, Frederick Antal, Arnold Hauser and Charles de Tolnay. We should also mention Jenő Lányi, who only spent his childhood in Hungary, as he studied in Vienna and Munich. A scholar of Jacopo della Quercia and Donatello, he finally emigrated to London in 1938, and died as a casualty of a German torpedo attack in 1940 on his way to the US. I haven't had time to upload anything here for over a month - but a lot has happened in Hungary in the field of medieval art. I will try to catch up with a series of brief posts. First, I would like to report on the new medieval exhibition of the Hungarian National Gallery, which was completely reinstalled and opened at the end of September. This part of the permanent exhibition focuses on painting and sculpture from Hungary and neighboring areas in the 14th and 15th centuries. 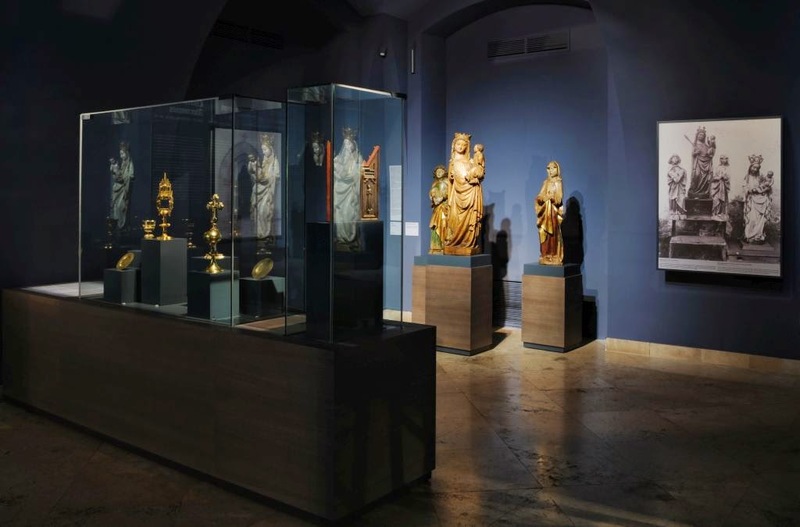 Some of the highlights of the collection can be seen here, including two statues of the Virgin of Child from Toporc, the two beautiful statues of female saints from Barka, or a painting originally showing the St. Joseph's Doubt (now cut down to only show the Virgin, see left). 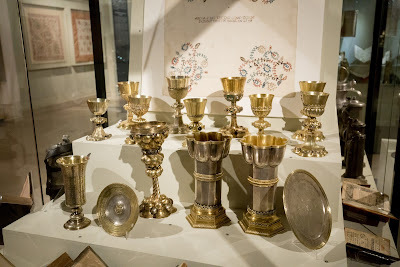 The exhibition was reinstalled to focus on the original liturgical context of these artworks, and therefore also includes a number of other liturgical objects - mainly goldsmith works on loan from the Hungarian National Museum. The new exhibition presents the material in a chronological-regional arrangement. The last section includes several complete altarpieces, thereby preparing the visitor for the next section of the permanent exhibition, where the monumental late Gothic altarpieces can be seen. That section has also been slightly rearranged recently, with the new installation of the main altar from Kisszeben. The new exhibition, which provides a greatly improved space for the objects and a clear narrative for visitors, is definitely a must-see for anyone interested in medieval art. Organized by curator Györgyi Poszler, the exhibition also includes a number of works previously never shown, This was made possible by the continuous work of restorers during the last few decades. Readers familiar with Hungarian are encouraged to consult a new publication by the Hungarian National Gallery, which is dedicated to the most important restorations carried out between 1957-2011. The publication is available online from this link. In addition, you can see selected objects from this part of the collection on the website of the Hungarian National Gallery. 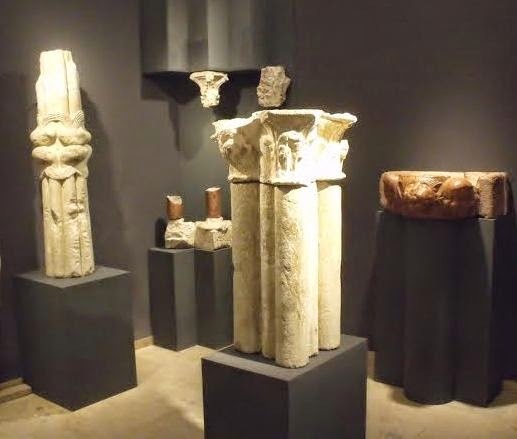 The exhibition of Renaissance stone carvings (the area of which was unfortunately partially taken over by the museum shop) was also reinstalled - but the medieval stone carvings are still not on view (following the theft three years ago). Here are some images of the new exhibition, provided by the Hungarian National Gallery. 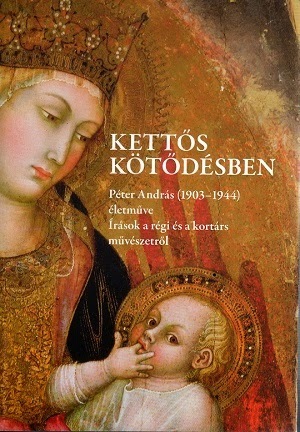 Luckily, I am able to report on more and more books published in English (or German) about the art of medieval Hungary. These books make the rich medieval heritage of Hungary available to a wide international audience - especially when we are talking about books published by western publishing companies. The books listed below deal with different aspects of medieval Hungary, and would be welcome additions to any serious library on medieval art. Visegrád stands out among the medieval sites of Hungary and the royal palace complex can be regarded as one of the most important monuments for the artistic and architectural production of the royal court during the period of the late Middle Ages. The size and the complexity of the palace would in itself ensure that the Visegrád royal residence became one of the principal sites of Hungarian medieval archaeology. The palace was continuously built, altered and enlarged for two hundred years, and emerged as a sophisticated complex of dwelling rooms, spaces of status display, ecclesiastical buildings (royal chapel and Franciscan friary), kitchens, workshops, storage buildings, gardens, loggias, balconies and fountains. Its ruination was also a long process that took three hundred years. Although this slow process caused immeasurable damage, it also helped to preserve the traces of medieval life in the monument, which in case of buildings continuously inhabited are usually swept away by modern use and later architectural changes. The Visegrád Palace, however, was not used by anyone after the Middle Ages. Its ruined buildings were not utilized for any other purpose, and so the later alterations were minimal. Its rediscovery, excavation and reconstruction has been a task of twentieth and twenty-first-century archaeology and heritage protection, and the monument provided an opportunity to study a medieval complex almost undisturbed. The excavations at the Visegrád Palace also served as one of the most significant steps in the development of medieval archaeology in Hungary. This volume is the first comprehensive monograph on the archaeological investigations, objects, finds, reconstruction and restoration of the palace complex published in English. 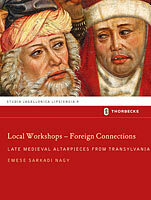 It is also a revised, extended and in some other parts compressed version of a volume published in Hungarian in 2010. It offers a summary of the previous and recent excavations since 1934 and the interpretation of the palace in its European archaeological and art historical context. It also contains the functional analysis of the palace complex and the discussion of the interactions between the residence and the Franciscan friary. Some chapters focus on the most important group of finds (pottery, stove tiles, worked bone material, etc.) along with their detailed catalogue. Ivan Gerát: Legendary Scenes : An Essay on Medieval Pictorial Hagiography. Bratislava : Veda, 2014. "This book is devoted mainly to scenes from the lives of saints in panel paintings originally produced in the northern regions of the Kingdom of Hungary in present-day Slovakia. The form these pictures took and their rôle in cultural life was determined by various processes concerning the whole of Christian Europe. Research into these pictures necessarily crosses both modern and historical political boundaries. Around 1500 panel paintings enjoyed great popularity across Central Europe. Carefully elaborated pictures of violent or miraculous events from the lives of the heroes and heroines of the faith were placed primarily on the wings of altar retables. [...] Prior to the work of the Reformation, these pictures played a central rôle in religious and social life. They articulated many of the problems and tensions of the period, which was marked not only by internal disputes in the Christian countries, but also by growing conﬂict with the Ottoman Empire, which resulted in the resounding defeat of the Kingdom of Hungary in 1526 at the Battle of Mohács." Kinga German: Sakramentsnischen und Sakramentshäuser in Siebenbürgen. Petersberg: Michael Imhof Verlag, 2014. 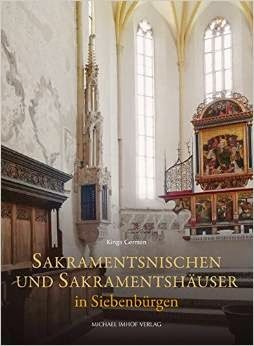 Kinga German's book provides an analysis and overview of 145 Late Gothic sacrament houses and sacrament niches from Transylvania, along with a catalogue of all these monuents. The analysis deals with the function of these micro-architectural elements in the context of Eucharistic worship in later medieval Transylvania. The book - based on the author's doctoral dissertation - provides the first detailed survey of these monuments. A look at the contents and the inside of the book is available on the website of the publisher (pdf). 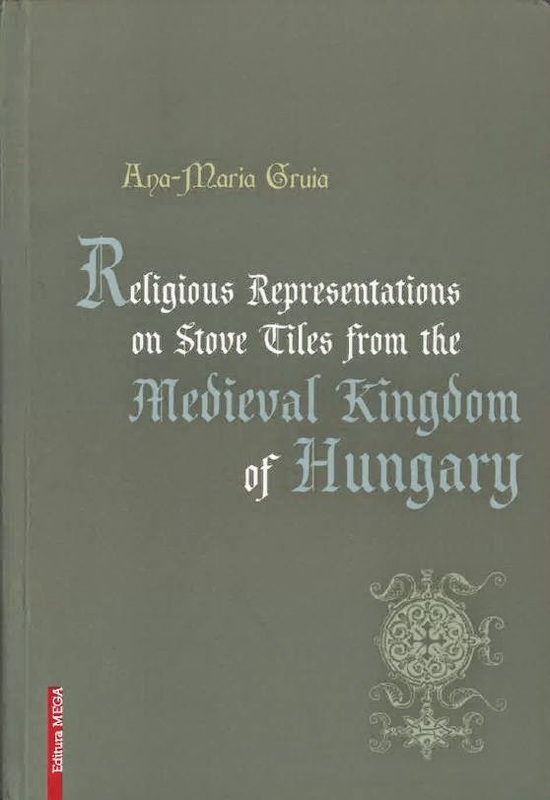 Ana-Maria Gruia: Religious Representations on Stove Tiles from the Medieval Kingdom of Hungary. Cluj-Napoca, Mega, 2013. 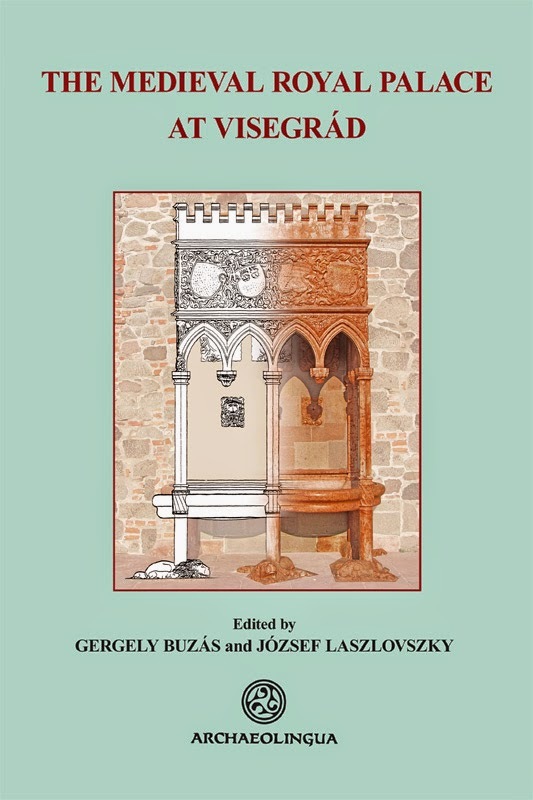 This book, which is based on the author's doctoral dissertation defended at the Central European University in Budapest provides an iconographical analyisis of late medieval stove tiles from the Kingdom of Hungary. It is the first detailed analysis of the subject, arranged according to themes, and accompanied by a catalogue of several hunders of monuments. The author has previosly also published a number of articles on the subject, especially in Studia Patzinakia - see for example in vol. 5, 2007 (pdf). 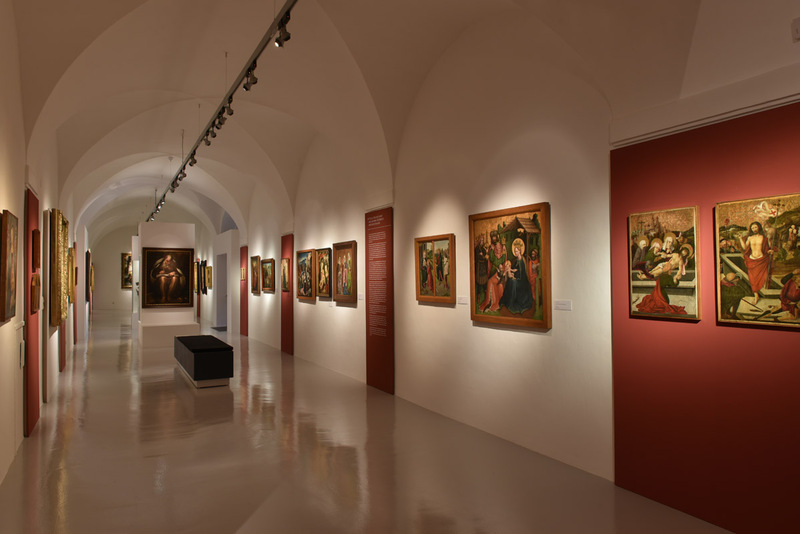 For several decades now, the Benedictine Archabbey at Pannonhalma has also served as an important exhibition venue. Perhaps most memorable for medievalists was the 2001 exhibition dedicated to Benedictines in Medieval Hungary, and titled Paradisum plantavit. For a long time, there has been a permenant exhibition space in the abbey as well, but only a very small part of the abbey's collection was on view. 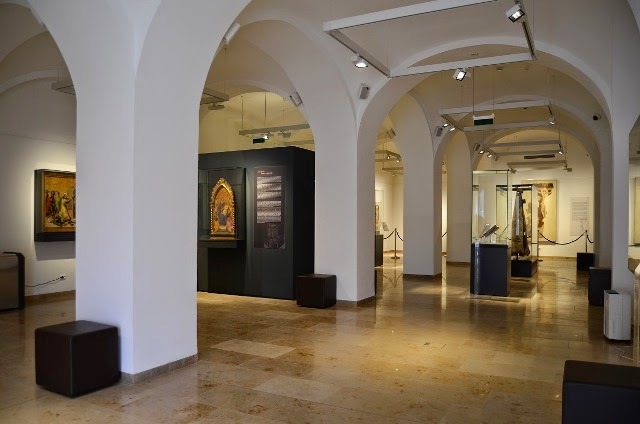 This year, a new abbey museum and visitor center opened at Pannonhalma, in the former manor building belonging to the abbey. 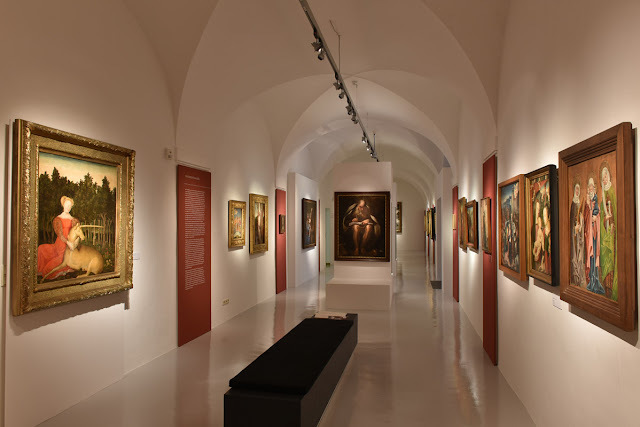 This museum is the home of a new permanent exhibition of the abbey, and includes an exhibition of medieval stone carvings from Pannonhalma, as well as a good selection from the collections of the abbey. 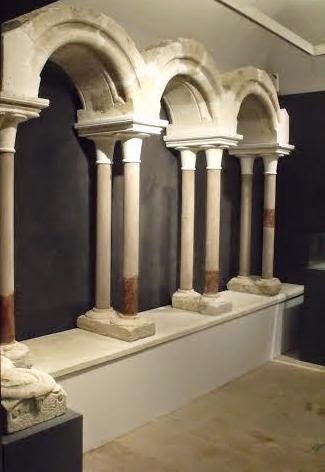 The new space created an opportunity to display some elements of the medieval building which were previously not visible, such as elements from the 13th century cloisters of the abbey (which was rebuilt in the late 15th century). The collections of the abbey include goldsmith works, important manuscripts, a good ensemble of paintings, sculptures and liturgical objects, among other artworks. 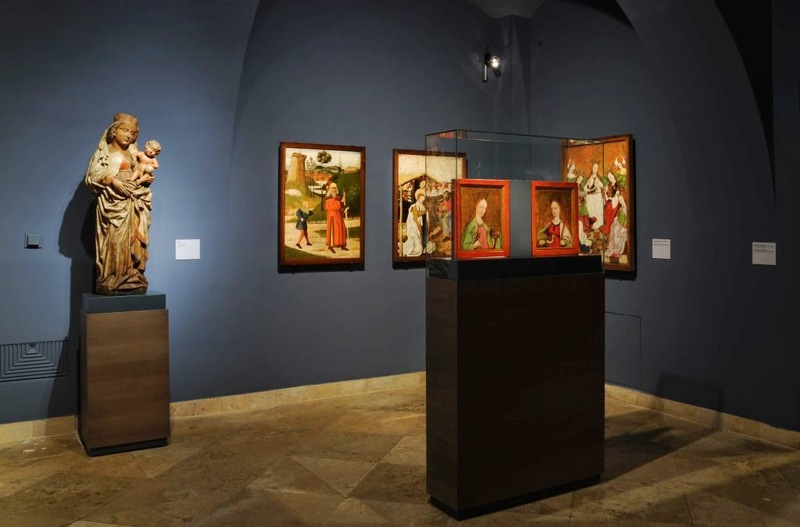 The new exhibition was arranged by Imre Takács, noted medieval art historian and the curator of major exhibition at Pannonhalma in 1996 and 2001. This collection can be browsed online as well - in a database which at the moment seems to be available only in Hungarian. In 2014, visitors also get a chance to visit two intertwined exhibitions. Since March 2014 the exhibition Icons and Relics: Veneration of Images between East and West (March 21 – November 11,2014) can be visited in the in the “old” exhibition hall of the monastery. Another exhibition opened in July in the newly opened Abbey Manor Visitor Centre and Museum. 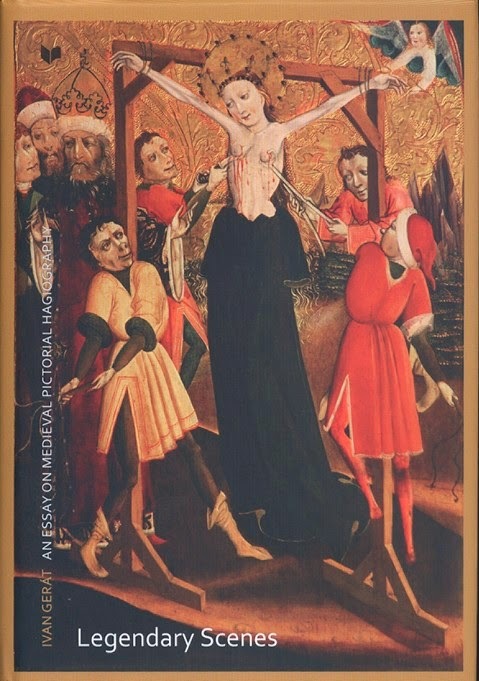 Titled Image and Christianity: Visual Media in the Middle Ages (July 10 – November 11, 2014), which focuses on western European liturgical art. To cite the curator, Péter Bokody: "The aim of the exhibitions is to show to the viewer the various forms and media of image-worship in medieval Christianity. The exhibition Icons and Relics presents the intertwined history of image-worship in the East and West through a comparison of the cult of images and the cult of relics, together with the genesis of the painted panel. The exhibition Image and Christianity focuses on the same development from the perspective of the visual media in the Middle Ages, where the spread of the painted panel in the West is interpreted in the context of mosaics, stained glass, murals and book illumination. The point of intersection between the two is the Latin Sack of Constantinople in 1204, since both the intensified forms of image-worship and the visual medium of the painted panel became central in Western Christianity after that." The exhibition "Icons and relics"
Glimpse into the exhibition "Image and Christianity"
In addition to important loans from the major museums of Hungary, the exhibitions also features a number of international loans (primarily from Austria and Croatia), providing a nice overview medieval artworks in the service of liturgy. 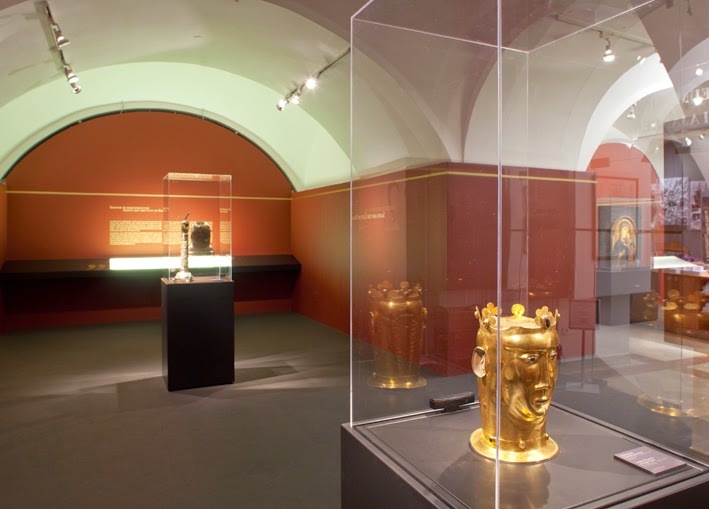 The highlights of the exhibition Icons and Relics are the 12th century head reliquary of Saint Coloman (Benedictine Abbey, Melk), and 14th century reliquaries from Zadar. In the exhibition Image and Christianity the various medieval visual media are presented by 12th century mosaics (Museo Torcello, Torcello), 15th century stained glass windows (Universalmuseum Joanneum, Graz), 14th century fresco fragments (Museum of Fine Arts, Budapest), 15th century painted panels (Hungarian National Gallery, Budapest), and 11th-15th century codices, as well as ivory carvings and other works. The National Museum in Warsaw (MNW) has one of the largest collections of medieval art in the region, which has been on view in a new installation since the end of last year (the gallery opened on December 11, 2013). Last week I finally had a chance to spend again a few days in Warsaw, and went to see the exhibition. Then I went back for a more detailed look - there is so much to see that one visit is definitely not enough. The exhibition is located on the ground floor of the museum, and takes up about 800 square meters in three large halls. These rooms are full of the best of late medieval art from the territory of modern Poland, while also include a few other works from other parts of Europe. The first room provides a rather dramatic entry for the entire exhibition. It is a wide hall, where two lines of statues divide the room as if in a three-aisled church, and at the center, directly opposite the entrance is one of the largest altarpieces in the museum. The dark environment contributes to the church-like feel of the hall. 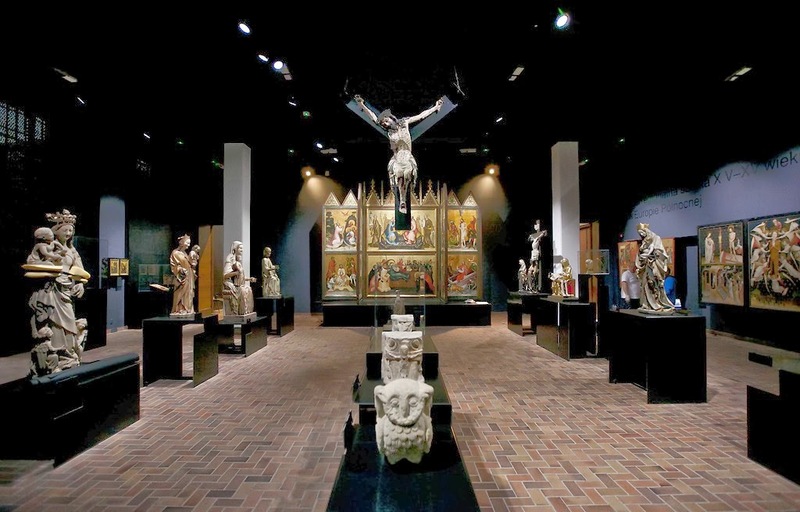 This first room displays the earliest works in the collection, including Romanesque sculpture, as well as what is called the Inter-regional Art of Northern Europe in the 14th-15th centuries. There are a number of French and German statues here, but the most important works come from the territory of Silesia - which at the time was a possession of the Crown of Bohemia. The international connections are also illustrated by such works as the carving of Three Marys from a Crucifixion-group, carved in alabaster by the Rimini Master, and coming from a church in Wroclaw. Among a number of late Gothic statues stemming from Wroclaw (Breslau), one can also admire the famous Beautiful Madonna from Wroclaw - made either there or in Bohemia at the end of the 14th century. The large altarpiece in the center of the arrangement comes from Grudziadz (Graudenz) in Pomerania, from a chapel of the Teutonic Knights. It is one of the most refined painted altarpieces of the International Gothic Style, dating from 1390 (or maybe somewhat later). The installation enables one to study all the paintings on the altarpiece, including the Passion-scenes of the first opened stage of the altar, and the Life of the Virgin scenes on the fully opened altar. Other works in the room - originating from Gdansk (Danzig) round out the rich demonstration of the International Gothic. 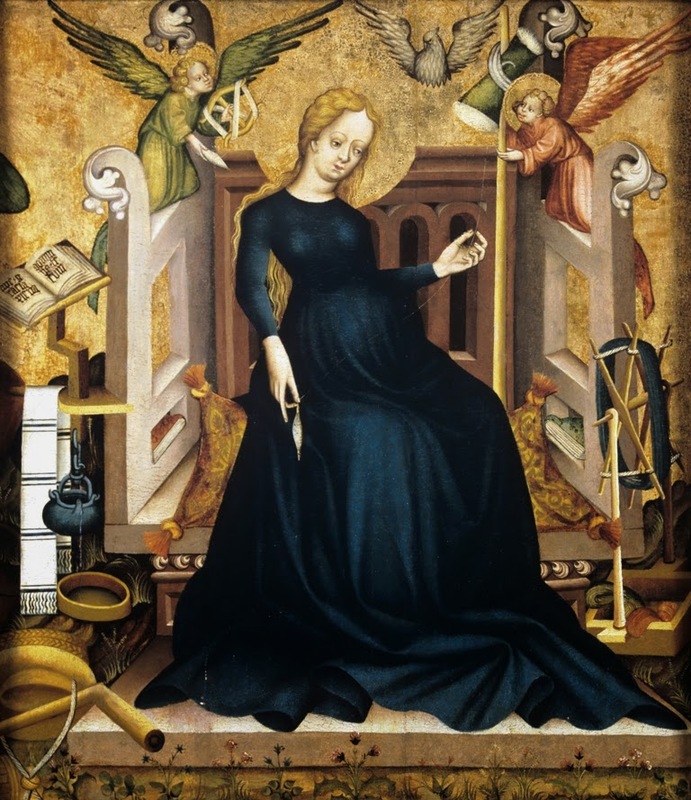 The next section of the exhibition (in the second, long exhibition gallery) focuses on Wroclaw and Silesia at the middle of the 15th century, with the St. Barbara Altarpiece from 1447 as the main work here. Proceeding chronologically, the next highlight is the Polyptych of the Annunciation with the Unicorn, a wlarge altarpiece from around 1480. As the visitor turns and enters the third long room, artworks from Silesia dating from the the decades around 1500 can be studied, among them the unpainted limewood relief of St. Luke Painting the Virgin by Jakob Beinhart. This sophisticated carving, based on a woodcut by Veit Stoss, demonstrates the very high level of artistic achievement in Wroclaw at the end of the 15th century. The Belvedere Museum in Vienna is presenting the exhibition Vienna 1450 - The Master of Lichtenstein Castle and his Time, in the Orangerie. The Belvedere is the first museum to devote an exhibition to this outstanding Vienna-based artist who was given the invented name Master of Lichtenstein Castle – a great anonymous painter who numbered among the most important Central European artists of his generation. As the Belvedere website informs: "The precious panels by the Master of Lichtenstein Castle are now reunited for the first time and displayed in the context of important comparable works from international collections. The unidentified painter went down in the annals of art history as the Master of Lichtenstein Castle, named after the knight’s castle near Reutlingen in Baden-Württemberg. The presentation of two monumental altar panels, which in the mid-nineteenth century ended up in Lichtenstein Castle, built by Count William of Württemberg and accommodating a rich art collection, rapidly contributed to the fame of the works. Since then, the œuvre of the great anonymous painter has grown to the impressive number of 23 panels, which were literally torn apart and widely dispersed before 1825, so that the knowledge about their original context got lost. Preserving as many as six panels, the Belvedere now owns the largest holdings of works by this master. The exhibition VIENNA 1450 - The Master of Lichtenstein Castle and his Time is the first effort to reunite the precious panels from Lichtenstein Castle and museums in Augsburg, Basel, Esztergom, Moscow, Munich, Philadelphia, Stuttgart, Tallinn, Vienna, and Warsaw and introduce a documentation of the reconstructed altar." 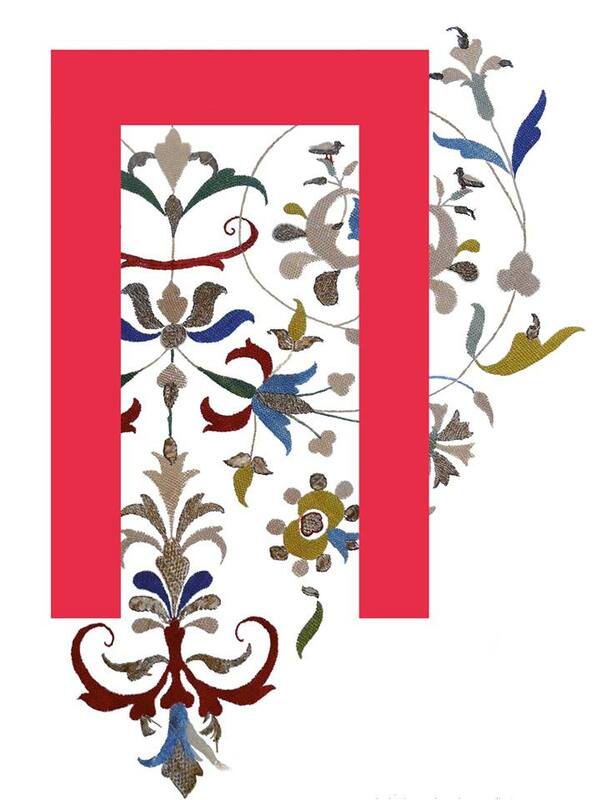 The exhibition is on view at the Belvedere until February 23, 2014, and is accompanied by a catalogue. The exhibition also includes two panels of the anonymous master, preserved at the Christian Museum in Esztergom: The Flagellation and the Crowning of Thorns. The images are not available on the website of the museum, so the links will take you to Europeana, where the images are available via the Institut für Realienkunde. You can also find a few other pictures of the Master via Europeana. The six panels in the Belvedere collection are available in the Digitales Belvedere database. I am looking forward to seeing them all together in Vienna! The panel was discovered in 2010 by the art historian of the Szolnok Museum, László Zsolnay, at the parish church of Kunhegyes. He was able to trace the history of the painting, which comes from a small chapel near Kunhegyes, at Tomajpuszta. This Neo-Gothic chapel has been erected by the Nemes family, and was completed in 1892. 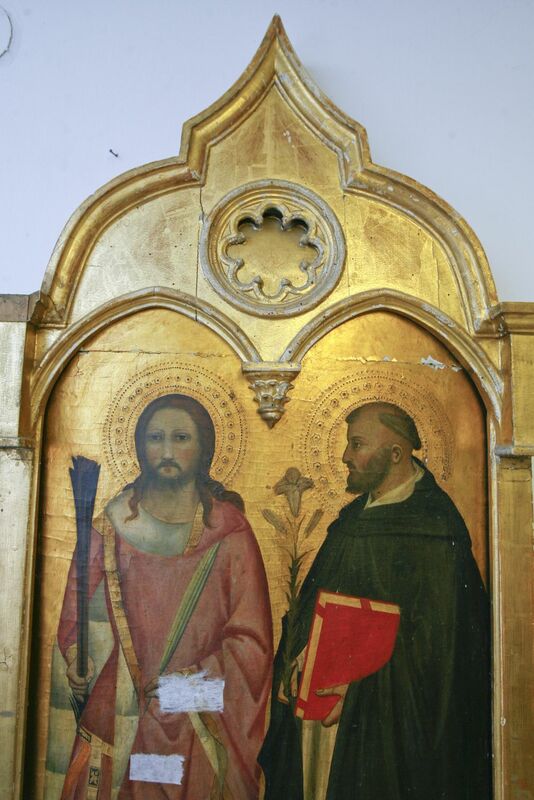 The Trecento panel was donated to the chapel around 1900. It stood there until 1945 - after which the chapel was sacked and fell into ruin. From the furnishings of the chapel, only this altarpiece was saved, which was taken to Kunhegyes and forgotten - until it was found by Zsolnay. On the back of the panel, there are two seals proving the legal export of the panel from Italy and its origin from Florence. It was established that the panel comes from the church of Santa Maria a Ricorboli in Florence. Ricorboli is now a suburb of Florence, just south of the Arno. The medieval church there was demolished around 1900, and its original furnishings were sold at the time, to raise money for the new church, built between 1906-1926 (which today still preserves a panel painting of the Virgin and child, attributed to Giotto and his workshop). The panel painting is the right section of a large polyptych, in a modern (Neo-Gothic) frame, and depicts two saints. The one on the right, facing towards the center of the former altarpiece, is St. Dominic. 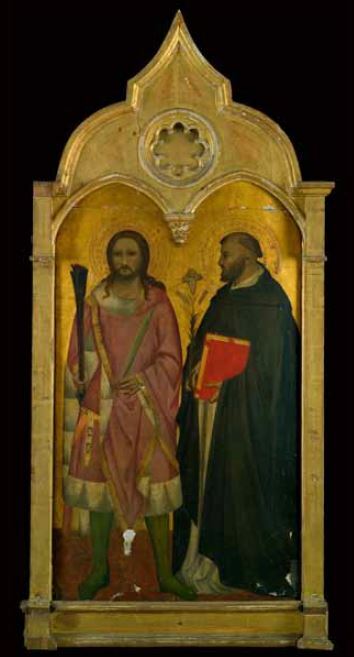 The other saint is a knight, who has been tentatively identified by dr. Prokopp as St. Nemesius, while László Zsolnay proposes that he represents St. Sebastian (with a bunch of arrows in his hand). Other parts of the altarpiece have so far not been identified. It is quite clear that the painting comes from the circle or workshop of Andrea Orcagna, the leading master in Florence after the Black Death of 1348. Mária Prokopp proposed a possible attribution to Jacopo di Cione, while Angelo Tartuferi, curator of medieval art of The Uffizi attributed it to Giovanni del Biondo, when asked by Zsolnay (Tartuferi has since become the new director of the Galleria dell'Accademia). However, the current condition of the painting makes the task of attribution difficult. I've recently written brief reviews of several English or German language books about the art of medieval Hungary - including the conference volume published by Villa I Tatti on Italy and Hungary in the Early Renaissance or Evelin Wetter's book on late medieval goldsmith works from Hungary. I am happy to report that two new books in English have been published on the subject - both will be treated in more detailed reviews later on. For now, I would just like to inform my readers about these important contributions, both by young researchers, to the study of medieval art in Central Europe. The first book is part of the »Studia Jagellonica Lipsiensia« series: Emese Sarkadi Nagy: Local Workshops - Foreign Connections. Late Medieval Altarpieces from Transylvania. Ostfildern, 2012. Here is the brief description: Altarpieces are complex works expressing the intellectual, economic and cultural life of a country. This comprehensive volume provides in-depth art-historical and historical analysis of various groups of winged altarpieces in Transylvania, especially the areas inhabited by Saxons. A complete catalog of the surviving Transylvanian altarpieces and lots of color pictures document this important chapter in European history and make this book an indispensable reference work. 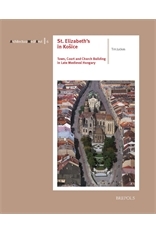 The other book was published by Brepols Publishers: Tim Juckes: The Parish and Pilgrimage Church of St Elizabeth in Košice Town, Court, and Architecture in Late Medieval Hungary. Turnhout, 2012. One of the most important building projects in late medieval Hungary was the reconstruction of the parish and pilgrimage church of St Elizabeth in Košice (present-day Slovakia). The burghers of this prosperous, free royal town decided to rebuild their main church shortly before 1400, and work continued, with several interruptions, into the late fifteenth century. Along with the ambitious and unusual design that emerged, far-reaching artistic connections with centres such as Prague and Vienna ensure the church’s exceptional value for architectural history – not only within Hungary, but in the Central European region as a whole. It is this value as an art historical document that the present work seeks to exploit. It approaches the church’s fabric as a source of information about patrons, masons, and congregations, attempting to locate the dynamics behind design choices made. This necessitates a detailed reconstruction of the building enterprise itself, before the focus shifts to the impact of the St Elizabeth’s project both in northern Hungary and further afield (Transylvania, Lesser Poland), allowing the town lodge’s remarkable achievements be set in inter-regional context. More information on both of these books is coming soon here on the Mediaval Hungary blog! New medieval art websites VI. A number of very useful online image databases have been launched recently, dedicated to late medieval / northern Renaissance painting. Also, access to digitized medieval manuscripts is getting more and more easy. Here is a selection - the following descriptions are based on texts given on the websites themselves. 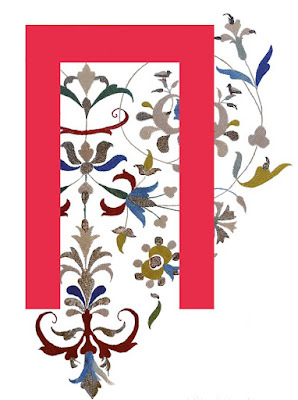 Flemish primitives - This website was created by the association of Flemish art museums, The Flemish Art Collection, and so is a collaborative project of Belgian museums in Antwerp, Ghent and Bruges. The goal is to present a website that is a reference point for the painted arts in the Burgundian Netherlands in the 15th century and early-16th century. Visitors can search paintings from Flemish museums or follow thematic collection presentations. It seems that over 400 paintings are available in the database now - I hope that image management and viewing options will improve later on. A lot more information and much more images are provided by the newly launched Cranach Digital Archive (cda). 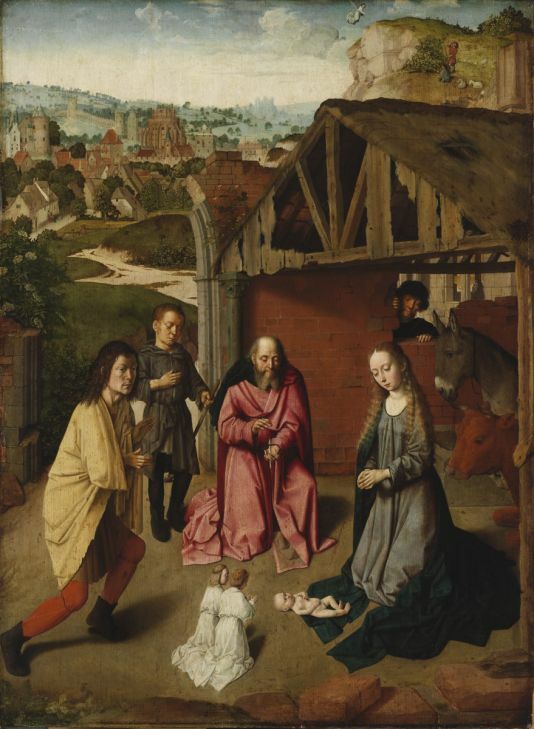 This is "an interdisciplinary collaborative research resource, providing access to art historical, technical and conservation information on paintings by Lucas Cranach (c.1472 - 1553) and his workshop. The repository presently provides information on more than 400 paintings including c.5000 images and documents from 19 partner institutions." The Cranach Digital Archive is a joint initiative of the Stiftung Museum Kunstpalast, Düsseldorf and Cologne Institute of Conservation Sciences / Cologne University of Applied Sciences, with several partner institutions. It is highly recommended (via 1100sor). While we are on the subject of manuscripts, I would like to call attention to a special resource from Hungary (it is not new, but perhaps not too many people know about it). 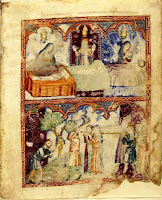 It is the Kaufmann-collection of medieval Hebrew manuscripts in the Oriental Collection of the Library of the Hungarian Academy of Sciences. The website provides an introductory study on the collector, Dávid Kaufmann and his collection, and the complete facsimile of five manuscripts. All of this is available in Hungarian, English and even Spanish. The manuscripts include the famous Kaufmann-Haggadah, originating from 14th century Catalonia, which has already been published in a print facsimile. 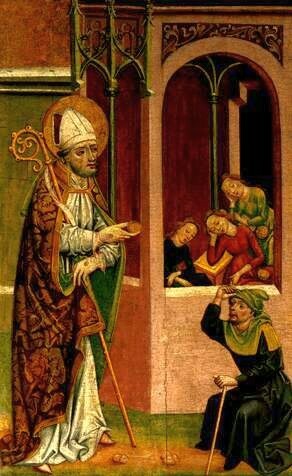 St. Nicholas providing dowries at night to the three virgins. Panel form the St. Nicholas altar of Jánosrét (Lúčky), c. 1480-90. 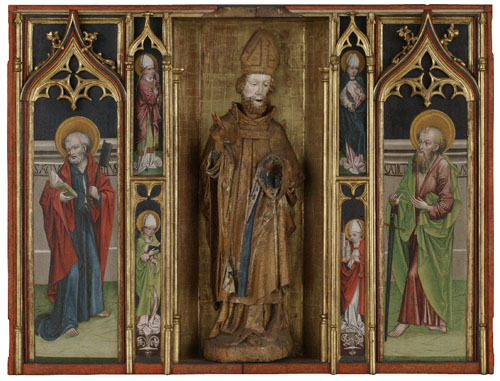 This is the central part of the altarpiece, with St. Nicholas in the shrine of the altar.